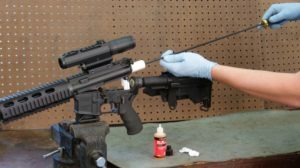 While the universal gun cleaning kits are designed to handle a wide range of firearms, they can be a bit large and contain many different components. They are not ideal to take with you to the range or on the road. 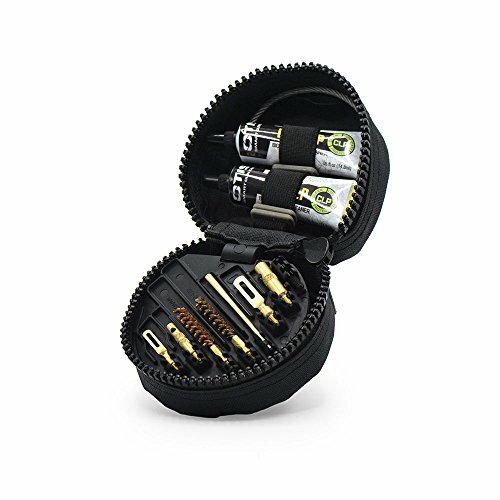 That is why we wanted to also take a look at the best smaller gun cleaning kits that can fit in your back pocket and are meant for the field. The following list contains our favorite picks for compact rifle and handgun kits. We looked at all the top kits and read through hundreds of reviews to arrive at the top five. As always, be sure to check the caliber of the kit you are looking at to make sure it accommodates your firearms. Many people purchase a kit, only to find out that the caliber of their gun is not included. 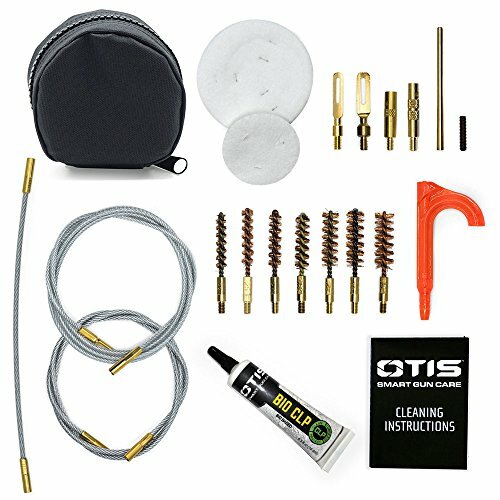 The most popular pistol/rifle cleaning kit for 2018 still goes to Otis. This kit is popular for a good reason. 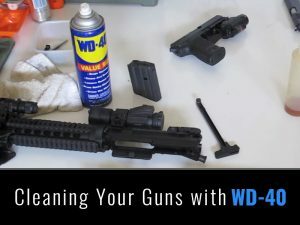 It has everything you need to clean just about every type of handgun. This kit is very compact and measures 4” x 4”, making It one of the smallest kits on the market. 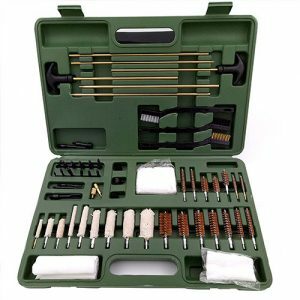 Not only will you be able to clean all handguns with this kit but most rifles and shotguns as well. We really wanted to include other brands than Otis in this list but after looking at all the cleaning kits, we can’t deny that Otis has become one of the best brands. This cleaning kit is Amazon’s choice, so we had to take a look at it and see why. Usually, Amazon chooses the best product based on user reviews and number of purchases, which seems to be the case here. My people love the compact case design and other don’t love it so much. Personally, I like it and it has everything neatly arranged and easy to find. 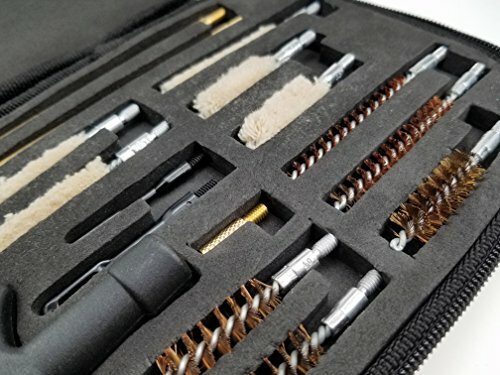 The quality of the brushes and other components are what you would expect from Otis and if one breaks you can always buy a new one on their site for a few dollars. 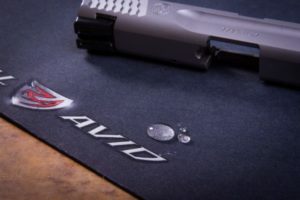 Designed to clean all 0.17 to 0.50 caliber handguns, it’s the perfect kit to put in your pocket and take with you on the road to clean the majority of your firearms. Rifle / Pistol Calibers: .22, .270, .30, .38, .45 cal., 12/10 ga.
You’ll always find complaints about any gun cleaning case. They are not the highest quality and it can take a little time to learn how to use it properly. If you’re not gentile, you can damage parts of the case. As always, be sure to read the specific caliber that this kit cleans. There are always people complaining that the kit doesn’t clean their firearm, when the details are labeled on the box. 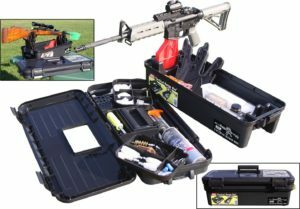 This kit is designed for cleaning your gun in the field or range and is not meant to be your primary cleaning kit. The case is made from nylon and small enough to fit into your pocket. Each of the tools snaps into the case or are held down by the polyester rubber bands. This may be the first gun cleaning kit where I have not seen any complaints regarding the case design. Many of the cases we review are thin material and this one is a hard ballistic nylon that’s waterproof and pretty much bullet proof. 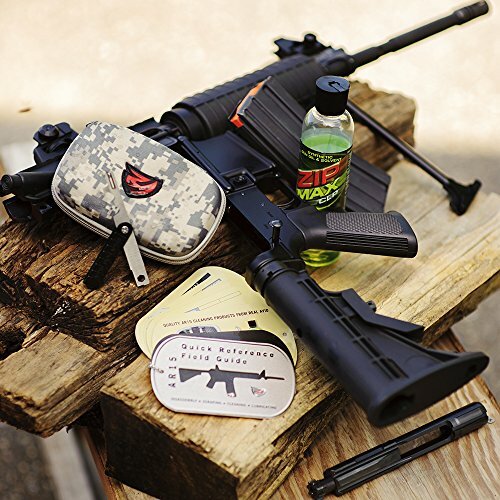 Certainly one of the best rated AR cleaning kits on the market and has everything you need for .223/5.56. The only additional items we would recommend is a good bore cleaner and the good old cotton swabs with handles. The Otis MSR/AR allows you to choose from either 7.62 / .308 or 5.56 / .223. We really like the AVID for the 223, so we will be looking at the 7.62 / .308 cleaning kit designed for the 308 Winchester / 7.62 NATO Rifles. Both kits come with everything you will need to clean all MSR/AR rifles. The case has an amazingly compact design and stores a wide variety of different tools. One of the highlights of this kit is the B.O.N.E. tool which allows you to clean the bolt carrier assembly. Many people who have used this tool say that it’s worth its weight in gold. 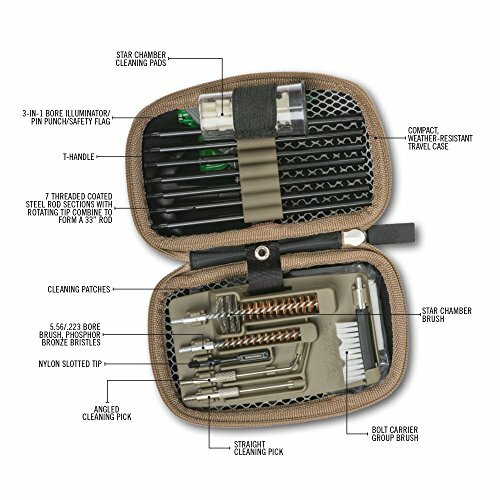 This kit has everything you need for your rifle and the pack is a nice compact design which allows you take it with you wherever you go. One thing I like about Otis is that they have an excellent warranty policy and very helpful customer support. If you have any questions they are always there to answer them. It was tough to find complaints about this one. By far this is most popular MSR/AR cleaning kit on the market and for good reason. As usual, you will get complaints about the pack. Not everyone will like the style of the compact design which can be too compact for many. Making it difficult to access all of the tools. 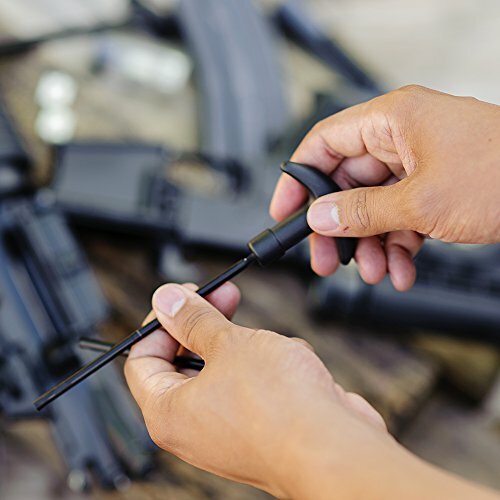 Like the majority of gun cleaning kits, some items will need to be purchased individually, such as boresnakes, cleaning solvent, and cleaning patches. 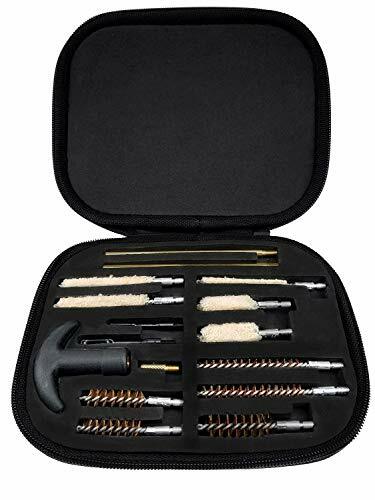 The Waydan 16 piece handgun cleaning kit is one of the best 9mm gun cleaning kits currently on the market. It is designed to clean all common handguns. All cleaning mops and brushes are labeled for easing cleaning. This kit includes five bronze brushes and five cleaning mops. When looking for a 9mm gun cleaning kit there are several things you really want to look at carefully. The case is made of high-quality polyester fabric and has a heavy-duty zipper. Personally, I am a fan of the smaller cases that you can easily take with you. This case is 6.5″ x 7.5″ and weighs 8 oz with all tools included. Comes with almost everything you need to keep your firearm clean and operating smoothly. The quality is average and there have not been many big complaints on the rod or brushes which you can usually expect with the lesser known brand but now so here. Compact, padded, zippered case holds all the necessary cleaning tools. Overall, not too many complaints with the Waydan but like usual there are always a few. Since it’s so inexpensive it’s not the best gun cleaning kit on the market but it will do the job. 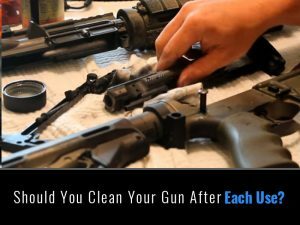 When it comes to gun cleaning kits you really want to spend a little extra to get the best quality if your firearms are important to you. Several complaints have been made regarding the quality of the tools. A few didn’t fit the right caliber, such as the .45. For the vast majority of pistols, I would say 95%, this kit will do the job. It’s a great kit for beginners or for those that don’t use their pistols often and need to give it a good clean once in a while. 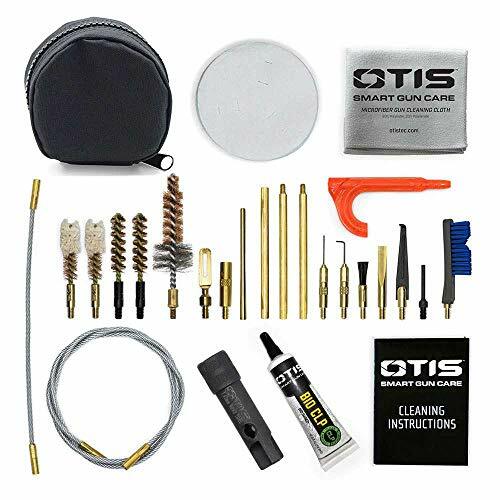 We looked at many different rifle / pistol kits and decided to go with the Otis Deluxe at the top spot for cleaning both rifles and pistols. It comes with Seven (7) bronze bore brushes and can be used for .22 – .40 caliber rifles and pistols. This kit is very compact measuring 10” x 10x and weighs 10 ounces. The carrying case is a soft nylon with a belt loop, so you can carry it on your belt anywhere you go. 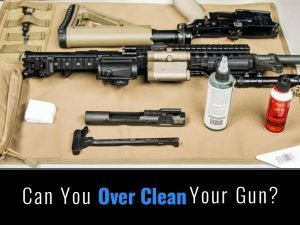 It has everything you need to clean all of your pistols and rifles and I’ve spoken with gun owners that have been using this kit for years and love it. Overall this kit does what it says. It cleans about 99% of rifles and handguns and the materials are very high quality. 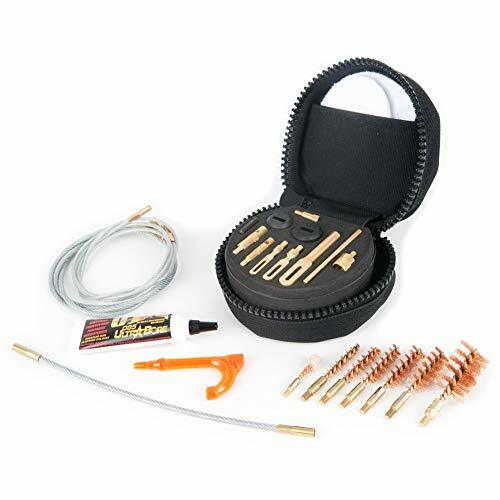 A great addition to this kit that many kits don’t include is the ultra bore solvent and cleaner. I really like the design of the kit and it’s very functional. Each piece has a place in the kit and I don’t think you can go with using the Otis Deluxe kit as a universal handgun / rifle cleaning kit. As always we try to find the flaws with each cleaning kit and this one didn’t have many. This kit is not designed for shotguns. A few complaints were are the pack, which has a foldable design which is a bit ineffective and difficult to use. Other than the pack design there have not been many complaints regarding the quality of the tools, which seem to be very high quality. 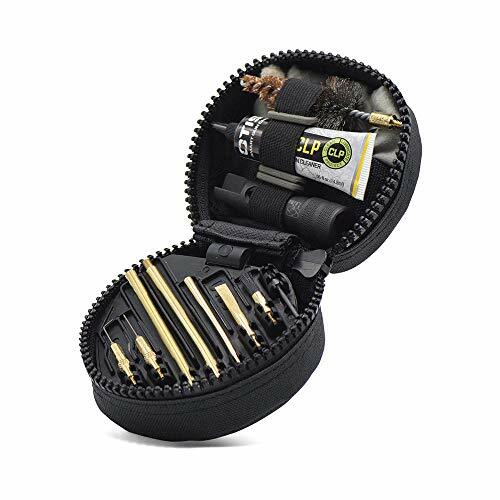 Any of these compact gun cleaning kits would make an excellent addition to your range bag but Otis leads this market. The kits are made in America and come with a “No Nonsense” warranty. Basically if something breaks in one of their kits they will replace it or refund you the money. That’s hard to beat!